This recipe really has me hooked. It is so easy and delicious and also very adaptable. When you have had a little practice, you can throw your vegetables into the roasting pan with the chicken and other ingredients. We have done it very successfully with baby potatoes and artichoke hearts cut in half and chokes removed. An all time favourite is with baby fennel bulbs cut in half or quarters that end up deliciously caramelised with all the juices. Slow-roasted garlic and lemon chicken was originally one of Nigella Lawson’s recipes, but I’m afraid her cooking times are far too long, her temperatures too high and the result totally inedible. 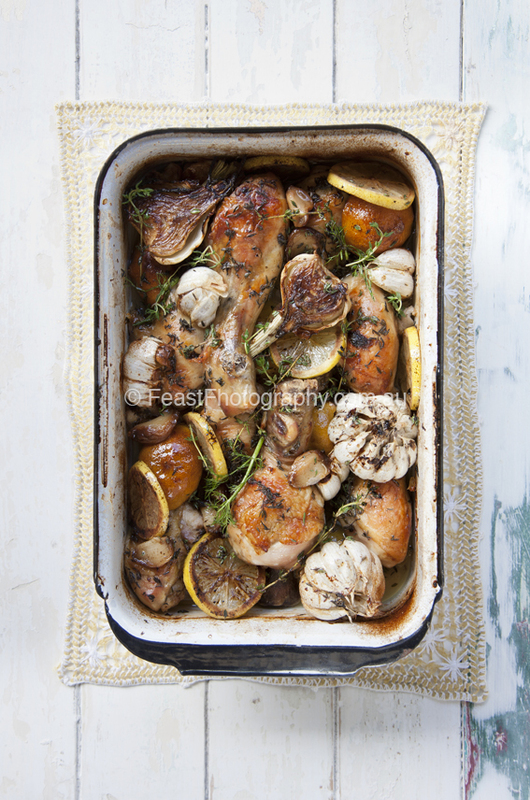 Put the chicken pieces into a roasting pan and add the garlic cloves and lemon wedges. Pull the leaves from most of the thyme stalks and sprinkle the leaves over the chicken. Retain the remaining thyme stalks to strew over the chicken later. Add the oil, then, using your hands, mix everything together, then spread the mixture out, making sure the chicken pieces are all skin-side up. Sprinkle over the white wine and add the black pepper. Cover the chicken tightly with foil, and place in the oven for 1 hour. Remove the foil from the roasting pan and increase the oven heat to 160C. Cook the uncovered chicken for another 30 – 45 minutes, by which time the skin of the chicken will have turned golden and the lemons will have begun to caramelise. The vegetables can be added during the cooking time depending on how long you estimate they will take to cook.